PROFIRE USA - Become an NRA Refuse To Be A Victim Instructor! Teach Refuse To Be A Victim! Become a nationally-certified, crime prevention and personal safety instructor! This is an outstanding program that was developed by the NRA in 1993 as a Women's Program. It was then expanded in 1997 to open it up to men and it has been taught to tens of thousands of people across the country by law enforcement and concerned citizens. The RTBAV Seminar is not about guns. It is an awareness and strategy-building education program that is suitable for adults and teens including those for which firearms are not an option and/or desired choice. Click here to watch the RTBAV Seminar promotional video! Various personal protection devices are discussed including pepper spray and civilian Taser units. Seminar participants that want to go further with these options may then take an NRA firearms course, pursue a concealed handgun permit, etc. but these topics are not part of the RTBAV Seminar itself. Instructors are mostly law enforcement officers but the instructor certification is also available to concerned citizens who would like to help others not be victimized. staying safe online and while traveling. There are also modules that focus on the special security concerns of youth and seniors as well as for workplace security. Participants receive a valuable workbook that also goes into greater detail than what can be covered in the Seminar. As a Certified Refuse To Be A Victim Instructor, you can offer the Seminar to the public as well as private groups, church members, employees, etc. You may offer the Seminar for free, to cover the cost of the student packets (about $5/person) or as a business activity charging typically $20 to $30 per person. Some RTBAV Instructors may teach a Seminar with up to 30 to 40 participants. 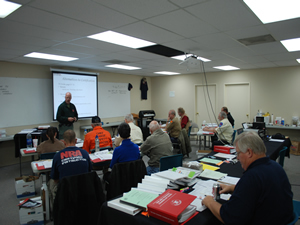 To become a Certified Refuse To Be A Victim Instructor, you must 18 or older, have a clear criminal record and complete the RTBAV Instructor Development Workshop which consists of the 4-hour Sudent Seminar followed by the 8-hour Instructor Course. Although you DO NOT need to be an NRA Certified Firearms Instructor in order to become a Certified RTBAV Instructor having both credentials may give you a competitive advantage. This 12-hour RTBAV Instructor Workshop can be delivered across two days or it can be taught in a 12-hour, one-day format. Add this instructor credential and begin helping people to REFUSE To Be A Victim!